Across air, land, sea and space, SELEX ES combines a full range of technologies to deliver integrated sensor solutions and offers a through-life capability management for defence systems and homeland security applications. SELEX ES is a leader in surveillance, protection, tracking, targeting, navigation & control and imaging systems and leverages on its international strengths to deliver powerful, innovative solutions. By forging and sustaining leading partnerships the Company provides proven capabilities to its customers. SELEX ES employs 7000 personnel with operations in the United Kingdom, Italy and the United States. SELEX ES is at the forefront of the design, development and integration of leading airborne sensing solutions for a variety of military and government aircraft. These advanced sensors are characterised by a truly open architecture, enabling them to be installed on new or retrofit platforms where they can be fully integrated or stand alone additions. Our Electro-Optic (EO) systems provide high resolution surveillance capability and enhanced vision for aircrew. Our EO sub-systems include high power lasers for long range designation of ground targets (selected for the Lockheed Martin Sniper pod and Joint Strike Fighter EO targeting system), long range target identification systems using Burst Illumination and world leading dual band cameras. Our systems are designed to improve mission effectiveness, enhance survivability and be affordable throughout their service life. By increasing the use of COTS components, we aim to ensure affordable capability with the effective insertion of state-of-the-art technology. Our Unmanned Aerial Systems (UAS) such as ASIO, FALCO and Mirach 100/5 lead the way in today’s networked battlespace. With a combination of our unique experience in mission systems, avionics simulation and real-time operation capability, we are able to increase situational awareness. SELEX ES offers a full range of multimode M-scan radar with proven reliability and low lifecycle costs with over 2000 radar for surveillance and fire control operating on a vast number of fixed and rotary wing aircraft including Tornado, Future Lynx and AW 101 helicopters. The Captor radar is deployed in front line service on the Eurofighter Typhoon, the ENR for the NH 90 and the Sostar/ TCAR radar for the NATO AGS. We are Europe's leading supplier of airborne radars. With a strong commitment to innovation and technical excellence, the company plays a leading role in major international airborne military programmes such as Praetorian, with defensive aids suites developed for the Typhoon, AH-64 Apache helicopter, Merlin and Super Lynx. SELEX ES is a provider of advanced integrated solutions for Armoured Fighting Vehicles and land based protection, surveillance, tracking and detection requirements. SELEX ES has a strong track record in providing state-of-the-art products such as turrets, weapon sights, day and night vision systems, remote weapon stations and unattended ground sensors. The modular architecture of the systems make them ideal for new or retrofit opportunities and can be stand-alone additions or be fully integrated with a weapon system. The Company has over 40 years experience in providing leading edge acoustic weapon detection systems. The Hostile Artillery Locating (HALO) system leads the way in new generation techniques of acoustic weapon and has been in service with the British Army since 2002. HALO is also in service with the United States Marine Corps as well as other international forces. Drawing on the wider product portfolio of the Finmeccanica Group, SELEX ES is currently positioning itself to prime major land vehicle programmes including Future Rapid Effect System (FRES) and Warrior Lethality Improvement Programme (WLIP). For the digitisation of the battlefield, the Company has developed a set of compact, lightweight sensors to deliver an integrated situational awareness package increasing survivability and mission effectiveness for the Italian Army. SELEX ES is a major supplier of Electro-Optics (EO) with over 50 years of experience in delivering leading edge EO and thermal imaging capabilities. The Company also delivers communications and network systems to a world-wide customer base, both military and civil. SELEX ES has extensive experience in radar and Electro-Optic (EO) sensors for naval applications dating back to the 1960s. With precision approach and navigation radars, surveillance, countermeasures, seekers, fire control systems, infrared Search and Track, and Seekers for S/S missiles, the Company participates in all major programmes of Italian and other European Navies and offers highly competitive integrated solutions. Civil authorities around the world are faced with emerging challenges in border control, domestic security, protection of critical infrastructure and information control. SELEX ES offers solutions based on cutting-edge technologies and sub-system integration expertise. Already a leading supplier of radar, infrared and acoustic sensors, we are heavily investing in detectors for explosives, chemicals, and biological and nuclear substances. More importantly, our area of expertise lies within integrating these technologies. 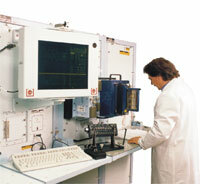 Systems are developed using superior products developed in-house, from the wider Finmeccanica group and those procured. With integrated systems on land, sea and air platforms utilising communication and processing technologies, backed up by comprehensive support mechanisms, we provide complete solutions to our customers’ needs. Our military operational experience allows us to develop technologies and systems supporting police, customs, immigration, coastguard, intelligence and other civilian services. Our complete-system approach ensures that we provide well-designed, well-supported solutions; ones that not only detect threats, but communicate and interpret the data to support decision makers in their response. With a presence in the European space industry dating back to the 1960s, SELEX ES leverages its unique expertise in the development and production of qualified optical payloads, RF equipment, photovoltaic assemblies, power conditioning & distribution units and robotic arms. SELEX ES provides a wide range of highly reliable solutions for earth observation, science, planetary exploration, navigation and telecommunication programmes, delivering innovative space sensors and sub-systems to international customers including the European Space Agency (ESA), the Italian Space Agency (ASI) and NASA. Space operations take place in Firenze, Nerviano, Pomezia, Edinburgh and Southampton where design, development, manufacturing and testing activities are carried out within an area totalling 18,000 m2. The Company also hosts clean rooms and laboratories equipped with appropriate space simulators and facilities for environmental and functional testing. SELEX ES provides a complete capability for design, development, manufacture and in-service support for current and future systems within the civil and defence markets. The Machined Components Centre (MCC) and Precision Casting Centre (PCC) provide a world class service offering comprehensive precision machining and casting services from conceptual prototype to full rate production. The Company is also driving innovation through the end-to-end support chain using solution modelling, information technology systems and technical expertise. The Unmanned Systems Flight Test and Trial facility, a recognised centre of excellence, is located in ParcAberporth, UK. SELEX ES offers integrated unmanned systems solutions including airframes, ground control stations and networked ground/ air sensors. The combined offering of ‘plug and play’ platform demonstrators and payloads, within a self contained trials facility means we have the capability to offer mission simulation, using real sensors in real-time. In conjunction with Thales and DSG, SELEX ES has formed an alliance to deliver Total Support Services (TSS), an integrated set of cross platform support services. In total, the three companies manage the supply of some two hundred thousand avionics system components. TSS provides on-shore industrial capabilities for through-life support and the upgrade of critical electronic systems. TSS integrates the capabilities of repair, spares, technical support, test solutions, software support and obsolescence support for both rotary and fixed wing aircraft, delivering guaranteed through-life availability, at reduced cost.